Last week Major League Baseball lost a legend when Yogi Berra died at 90 years of age. Ranked among baseball’s greatest players, many fans contend he was the game’s best all-around catcher. Born in 1925 in Saint Louis, his parents named him Lawrence Peter Berra. Yogi later gained his famous nickname from a friend who claimed he resembled a Hindu shaman (a yogi). His entry into the Baseball Hall of Fame in 1972 honored an exceptional career as a player and coach. 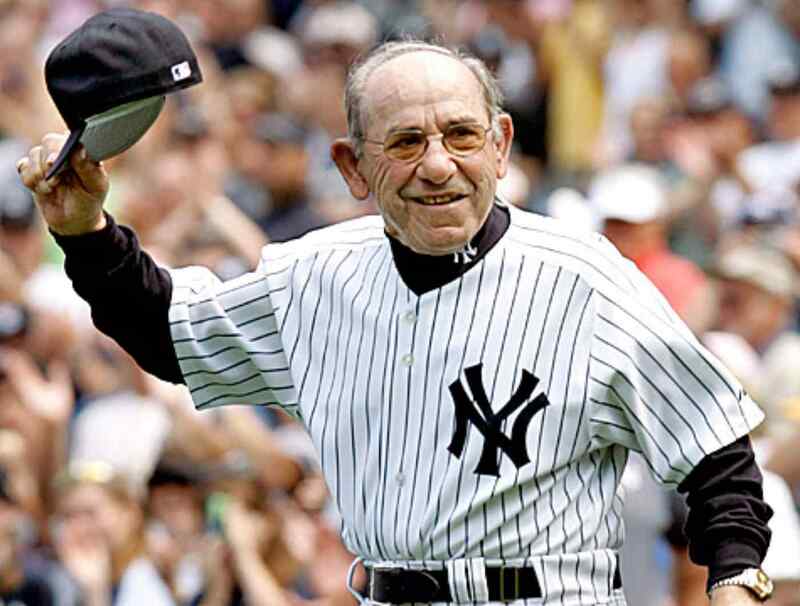 Following his naval military duty during World War II, the New York Yankees signed Berra in 1947. He eventually wore the famous pinstripes for nineteen years on the field and in the dugout. During his career, the Yankees appeared in fourteen World Series and won the title ten times. Berra played in fifteen All-Star games and won the league’s Most Valuable Player Award three times. After retiring as a player, Yogi first coached the Yankees’ cross-town rivals, the New York Mets. Then he returned to coach and later manage his beloved Yankees from 1976 to 1985. He finished his career as a coach with the Houston Astros in 1992. “It’s like déjà vu all over again.” Although Yogi wasn’t known for his foreign language skills, he confirmed that he uttered these words after watching back-to-back homeruns by Mickey Mantle and Roger Maris. “We made too many wrong mistakes.” This insightful observation came after the Yankees lost the World Series in 1960. Wrong mistakes must be much worse than right ones. It ain’t over till it’s over; and for God’s people, it ain’t never over. Thanks for the memories, Yogi. I recently preached a sermon series entitled The Gospel According to Dr. Seuss. We explored five children’s stories by the popular author. 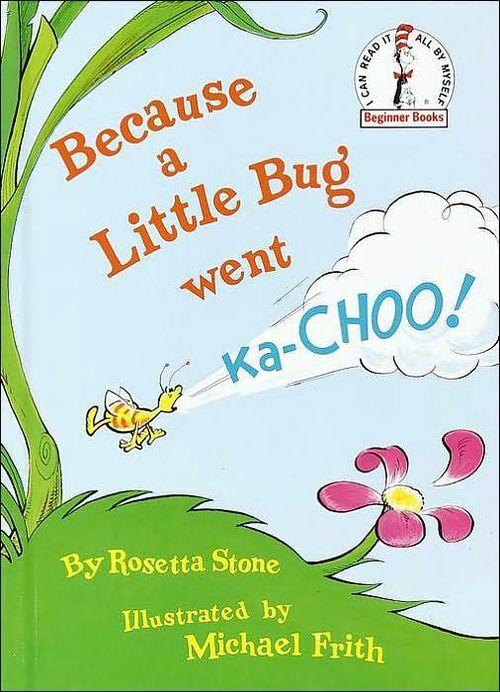 Because a Little Bug Went Ka-Choo! ranks among my favorite books by Theodor Geisel. Although Geisel normally used the pseudonym of Dr. Seuss, he published the 1975 book under the name of Rosetta Stone. Because a Little Bug Went Ka-Choo! teaches what appears to be a simple lesson that even preschool children can understand: actions always have consequences. A fundamental law of creation is the principle of cause and effect. If I do THIS, then THAT will happen. If you select THIS button on the vending machine, then THAT will come out. 1 + 2 = 3. A + B = C.
It’s the domino principle of life. Push one domino and others begin to fall. One thing leads to another and another and another . . . oftentimes with unforeseen results. In a world governed by the law of cause and effect, here is an important corollary principle: inconsequential actions do not exist. All we do affects ourselves and others. The person that mutters, “Well, I’m hurting only myself,” has not discovered this basic truth. Everything and everyone are interrelated. Seemingly small events can have huge consequences. A prime tenet of Chaos Theory is The Butterfly Effect. In a chaotic system, a very small change applied at a particular point in time makes the future change in dramatic ways. Something as small as a butterfly flapping its wings might affect the weather system on a global scale six months into the future. The Butterfly Effect may sound like hyperbole, but words and actions act like stones thrown into a still pond. The expanding ripples spread in unexpected ways to influence other people’s lives. We cannot always anticipate the results. Cause and effect. The dominos fall. No inconsequential words and deeds. All that we say and do affects our lives along with others. These are important principles for followers of Jesus Christ to understand. God does not call most of us to become missionaries or martyrs. Few will have the opportunity to serve God in blazing moments of glory. For the most part, Christian discipleship is acted out in the ordinary and everyday moments of life. However, these small acts of discipleship can have unimaginable consequences. Holiness is practiced in the humdrum of routine; but these “ordinary” moments can have an extraordinary effect. Our words and actions are powerful. What we say and do each day ripples through time and eternity. Cause and effect. Action and reaction. Truth and consequences. All because a little bug went KA-CHOO. God bless you! 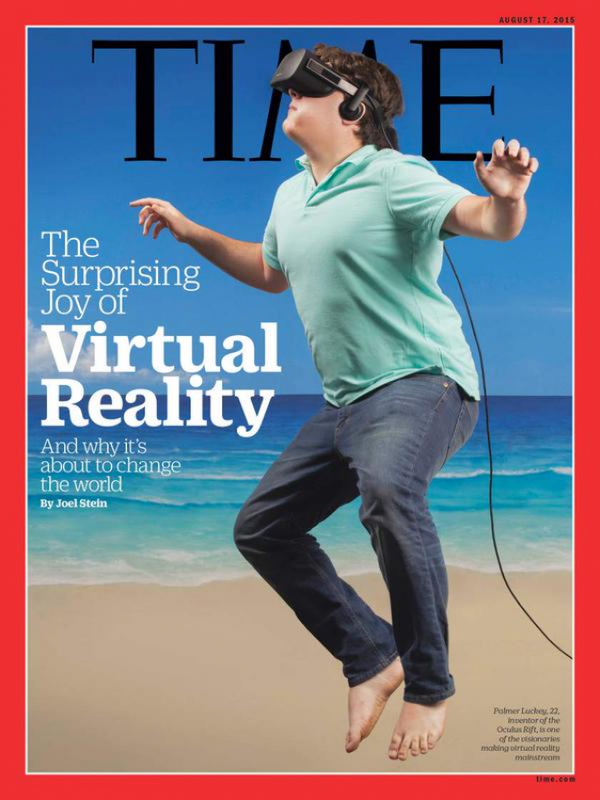 The cover article discussed the emerging field of virtual reality. Headsets transport users into a computer generated landscape. Although still in the development stage, science fiction promise is becoming science fact. Work also continues on augmented reality—the updated term for holograms. Experts foresee a day when glasses will be able to project realistic holograms on the real world. First adopters of virtual and augmented reality have even coined a term for the world around us. They call it REAL reality! However, a reader gets the sense that most prefer their alternate realities to the real world. But is even the real world really REAL? Much of what we consider real is no more substantive that a computer generated world. Albert Einstein said: Reality is merely an illusion, albeit a very persistent one. Jesus told The Parable of the Rich Fool (Luke 12) where a man enjoys a great harvest, builds bigger barns, and plans to enjoy a wealthy retirement. In the darkness of the night, however, he dies—and all his riches go to someone else. Christ defines what is real with a simple, diagnostic question: Will it last? Is it eternal or temporal? Storing up the things the world calls real will result in disappointment. Only treasures stored up in heaven’s vaults will last. True reality is not the physical but the spiritual, not the temporal but the eternal. In his classic book, The Great Divorce, C. S. Lewis describes a man’s visit to heaven. Lewis presents a strange but mesmerizing image of the afterlife. God’s kingdom is so real that the grass will not even bend under the feet of those newly arrived. Streams of water are as solid as moving roads. And those who first enter seem as ephemeral and transparent as ghosts. As persons travel up into the “high lands” towards God, however, they become more and more solid. The real world is NOT: paychecks . . . traffic jams . . . stocks and bonds . . . insurance policies . . . social status . . . school awards . . . recognition by our peers . . . latest fashions . . . our favorite TV program . . . politics . . . bank accounts . . . trophies . . . The real world IS: reading a book with our child . . . holding hands with your spouse . . . talking with a friend . . . studying Scripture . . . worship . . . prayer . . . sharing with someone else about Christ . . . feeding the hungry, giving drink to the thirsty, housing the stranger, clothing the naked, and visiting those who are sick or in jail . . . In summary, reality is the spiritual part of life, the part of life that is invested in eternity. Any part of life that is exclusively related to this world is not reality, but only a passing moment, necessary for the time, but certainly not ultimate. What is really real connects us to the eternal while we live in the temporal, links us to God’s kingdom while we continue on in the world. So . . . get real. Have you ever noticed how calendar time and real time are two different types of time? Confused? Consider this timely example. In school, children learn the four seasons of spring, summer, fall, and winter. Astronomers calculate the start and finish of each season based upon the sun’s solstice and equinox. According to calendar time, summer begins on June 21 and ends September 21. In real time, however, summer starts on Memorial Day weekend and concludes on Labor Day weekend. This weekend marks the real end of summer and beginning of fall, regardless of what the calendar might say. 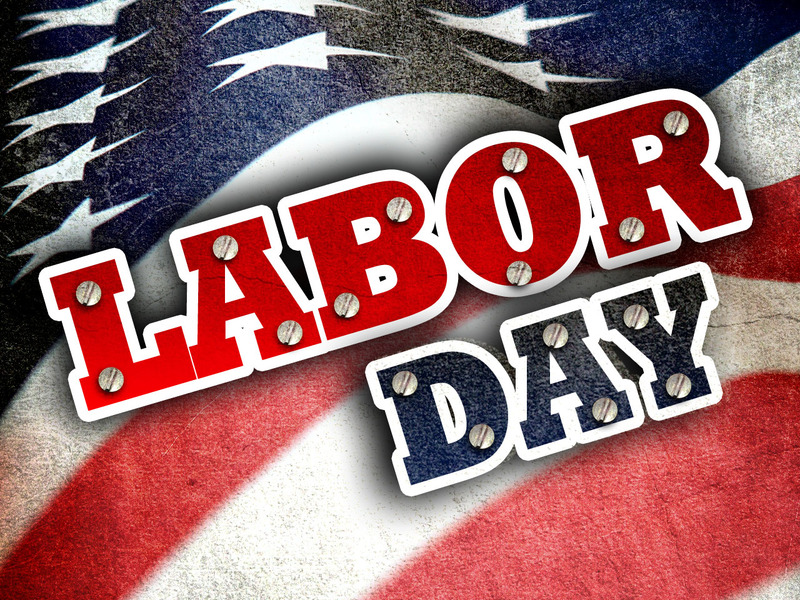 Labor Day is observed on the first Monday in September. Since September 1 fell on a Tuesday this year, the holiday weekend arrives as late as possible. New York City hosted the first Labor Day in 1882. A machinist and a carpenter organized a parade to recognize workers. The holiday quickly became a national observance. Few people consider Labor Day to be a particularly Christian holiday. The church gladly claims Thanksgiving, Christmas, and Easter; but the first weekend in September has never been considered a particularly religious observance. However, Labor Day reveals an important truth for God’s people. We are all guilty of grumbling and griping about our daily responsibilities. We often view work as a necessary evil; and we envision paradise as an endless vacation. We forget that work is a good thing created by the Lord for his people. Reread the creation account in Genesis 1-2. The Lord did not place Adam and Eve in the Garden of Eden to enjoy a life of ease. Instead, God created them for a life of productive and fruitful labor. They cared for the Lord’s creation, worked as gardeners in Eden, and served as stewards of this wonderful world. Work gives meaning and purpose to life. Fulfillment comes from using our God given abilities and resources in ways that are pleasing to the Lord. Labor Day weekend is an excellent time to reflect upon the jobs God has given us in heaven’s kingdom. Call is an important part of our understanding of the Christian experience. All of God’s children have responded to Christ’s common call. Each in his or her way has heard Jesus say: Come, and follow me. Along with our common call we each receive a variety of callings. In 1 Corinthians 12:4-11, Paul wrote: There are many different kinds of gifts, but the same Spirit. There are different kinds of service, but the same Lord. There are different kinds of working, but the same God works all of them in all men. Now to each one the manifestation of the Spirit is given for the common good. God created us as unique individuals, suited and equipped for different work. God’s people share a common call with a variety of callings. During the upcoming Labor Day weekend, give thanks to the Lord for the opportunity to work. Vocation is more than making a living, it is creating a life.